But not full-body toys, this time. 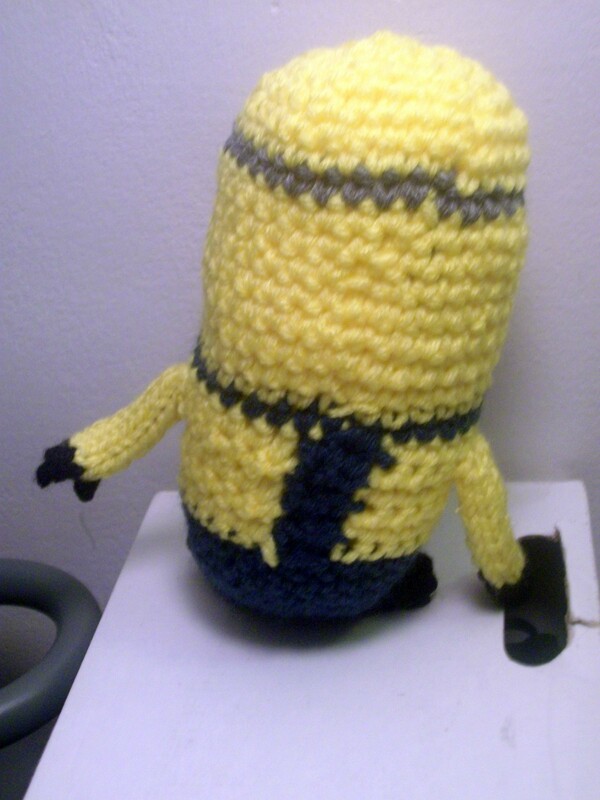 This one was a request from the minion-obsessed four-year-old. It’s a minion hat! The minion hat I mentioned working on here, to be exact. It’s made from Knit Picks’ Comfy Worsted in Dandelion, Celestial, Hawk, and White with a black button in the eye and Knit Picks’ Stroll in Midnight in a pom-pom on top for the hair. Which will be a surprise for this hat’s recipient’s grandmother. Except I have to put two eyes on it, because it has to be different from this one, of course. By request of the four-year-old himself. You can find more specific information on everything on the Ravelry project page. I’ve written before about making minions. The yellow ones are easy. They have a smooth, jelly bean or pill body with overalls that take up about one-third of their bodies. But when they turn evil with the PX-41 in the second movie, it gets more difficult. 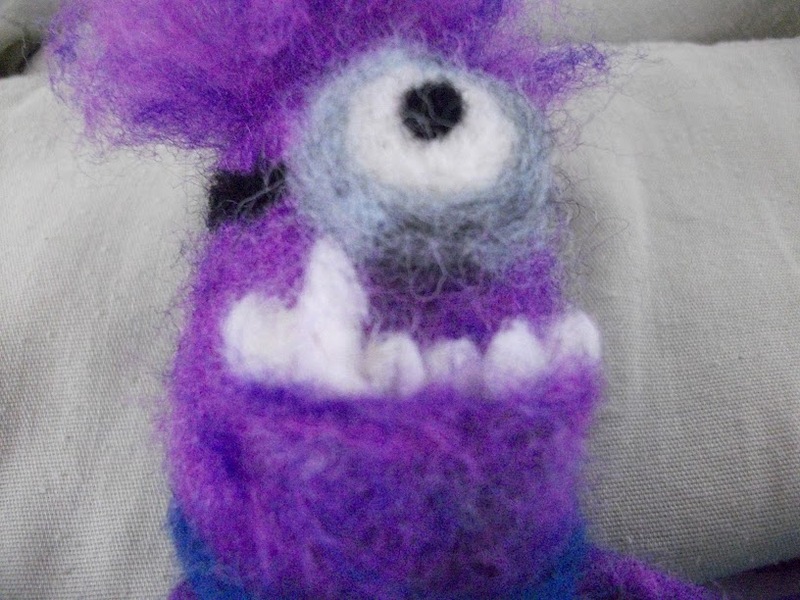 They get kind of fuzzy, with crazy hair and wonky teeth. Hmm, fuzzy. You can see where this is going, right? 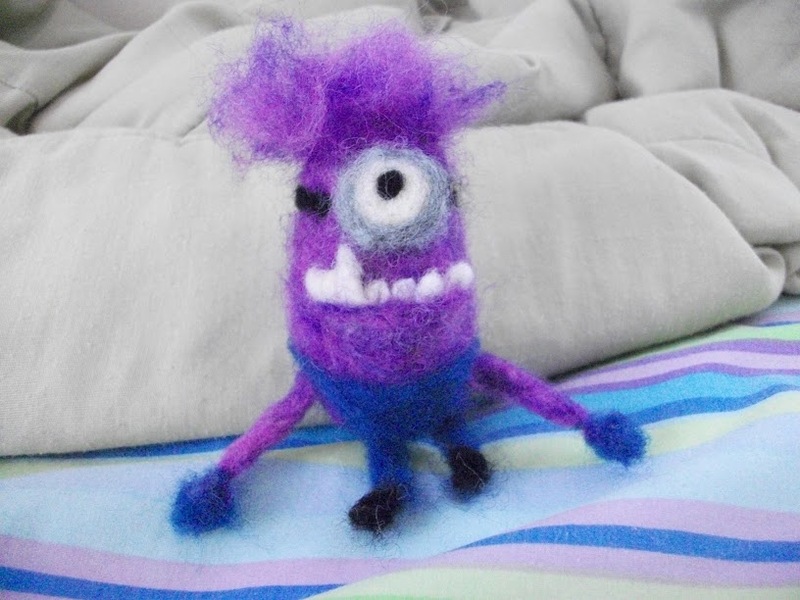 That’s right, needle-felted Evil Minion. I started with some plain white wool to create the base of the body. 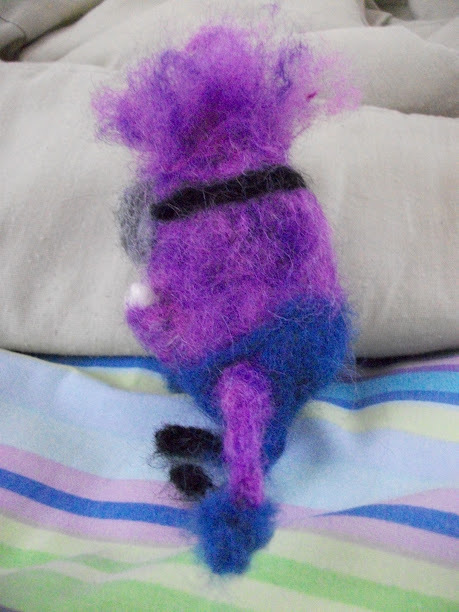 Then I mixed two different colors of purple to get the color close and made a second layer around the body. I made the overalls out of blue, and some teeth out of white. I made a flat piece for the bottom jaw and put the teeth on the inside of the mouth. The eye was a ball of white and a smaller ball of black in the center with a combo of black, white, and light blue for the goggles. 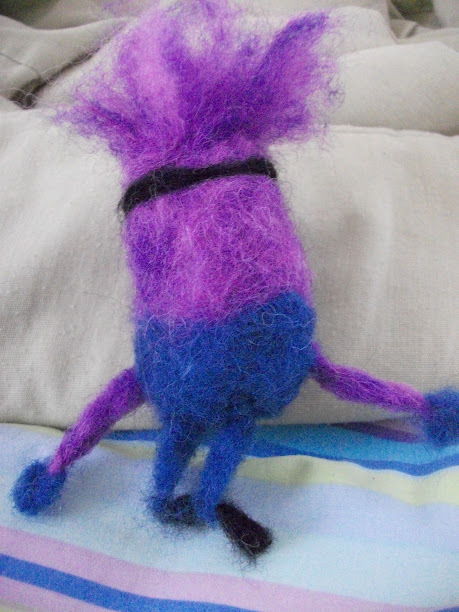 I added long tubes for the arms and legs, then lightly added the fluffy hair. My mom works for a non-profit agency as an administrative assistant. Once a year they hold a gala to raise money. That gala happens to be coming up in March, so everyone has been overworking themselves. I decided to help out. By making a minion for her. Not real help, but cute help. 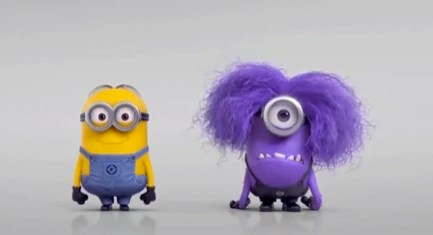 We’ve wanted minions from the first time we saw the commercials for Despicable Me. Now I have made one. I didn’t use a pattern for this one, but Just Crafty Enough has a similar pattern here. Mine is a mix of crochet and knit, but the pattern is knit in the round. What other characters do you find yourself wishing you could have for your very own? 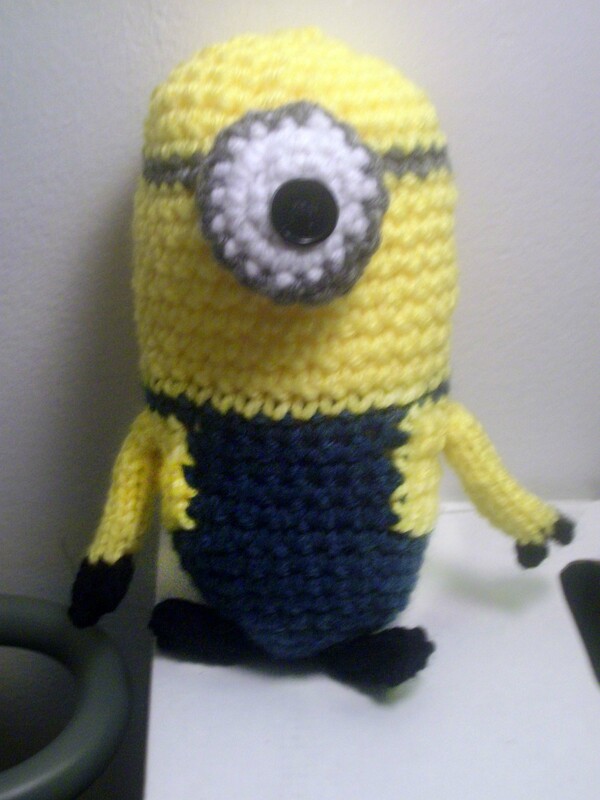 Anyone else made a Minion?